Late last year, my husband and I visited York....something to do with Mallard trains...I wasn't really paying attention...and of course, when four o'clock rolled around, we looked for a place for a nice cream tea. York is groaning with quaint little tea shops, each more enticing than the last. 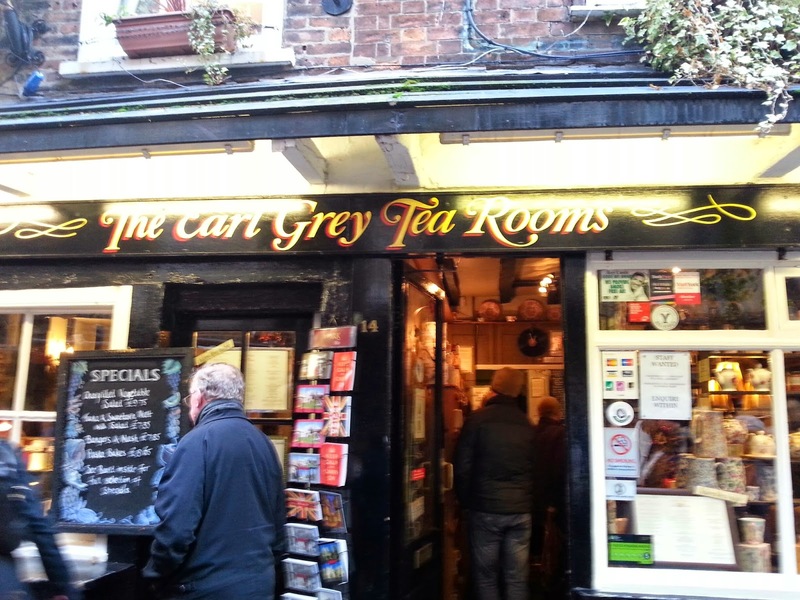 Fighting our way through the crowds on The Shambles, we found the Earl Grey Tea Rooms (13, The Shambles, York). Now, being an Earl Grey lover, the name spoke to me, and I was keen to go in. We were seated quickly, and soon ordered an afternoon tea. The atmosphere was genteel, the clientele smart and generally elderly and a touch aristocratic, and the menu superb. The afternoon tea came on a tiered cake stand, which always makes me smile, and we had little finger sandwiches on the bottom tier, scones on the middle tier and cakes at the top. If I recall, I ordered egg and cress sandwiches and Mr CTC had ham and mustard. Scones were large and fruited, but cold. The cream was definitely clotted, amassing points. We both had Victoria sponge cake to finish off. All in all, the experience scored highly on our (as yet unperfected) scoring system. I can't remember any points being lost, actually. I would go so far as to say it was highly recommended by us!